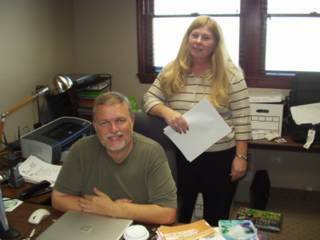 Offices of the Fellowship of Grace Brethren Churches (FGBC) moved into the BMH office complex in Winona Lake this past week. Tom Avey (seated), Fellowship Coordinator for the FGBC and FGBC staff member Sandy Barrett (standing) will now be working in the BMH building, along with Assistant Fellowship Coordinator Charles Ashman, who will also work out of his home part of the time. FGBC’s mailing address (P.O. Box 386, Winona Lake, IN 46590) and telephone number (574-269-1269) will remain the same, but the UPS/FedEx delivery address is now 1104A Kings Highway in Winona Lake. Visitors to Winona Lake are encouraged to visit the BMH/FGBC offices any weekday during working hours. The offices are located in the BMH building to the right (north) of the former Herald Bookstore.